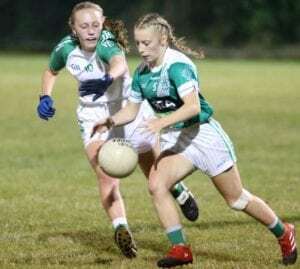 Shannon Richardson produced a star performance at Lawless Memorial Park, Swords on Wednesday evening to help O’Dwyers claim the New Ireland Assurance Junior ‘B’ Ladies Football Championship title. Playing at the home of Fingallians GAA, Richardson contributed an impressive tally of 0-8 as the Balbriggan side overcame the challenge of Ballyboughal. While there was little to separate the sides initially, a stunning Amy Gibbons goal gave O’Dwyers a decisive edge at the midway point in the contest. This placed them in pole position when the action resumed and they remained in the driving seat for the duration of the second period. Despite losing out to St Pergerine’s on July 25, O’Dwyers topped Group A with a record of four wins from five games. They subsequently progressed to the semi-final stage, where they got the better of Ballyboden St Enda’s ‘B’ last Wednesday night on a scoreline of 2-11 to 2-7. Ballyboughal, on the other hand, were runners-up to Ballyboden in Group B – having suffered a 1-16 to 6-7 reversal to the southsiders in their opening game of the competition. Indeed, with Templeogue Synge Street conceding each of their fixtures in the four-team section, the 3-11 to 0-6 away success over Foxrock/Cabinteely ‘B’ was their sole on-field triumph prior to the knockout stages. It was precisely the boost they needed ahead of a last-four meeting with Peregrine’s at Blakestown on August 15, however, as the northside outfit finished with three points to spare at the end of a high-scoring classic (0-25 to 2-16). They conceded an early point to Richardson in this showpiece affair, but it wasn’t long before Ballyboughal found their feet. Supplementing an equalising free by Ciara McConnell, full-forward Gioia Morgan Fox registered a brace of points to move them into a two-point lead. A Shauna O’Hara free kept O’Dwyers in the frame, only for Dublin minor star Katelyn O’Brien to maintain the ratio of a score-a-minute with an outstanding effort on the run. Although Richardson and McConnell proceeded to swap points, it was inevitable that the relentless pace of the early exchanges would give way to a more measured approach. O’Dwyers set up with midfielder Erica Byrne in a sweeper role, which left Niamh Counihan free at the opposite end. Even though Ballyboughal appeared to cope effectively with her presence initially, Byrne brought a halt to a number of first-half attacks. Meanwhile, the marauding Gibbons released Richardson for a goal-scoring opportunity on 12 minutes, but Sharon McGuirk was out to smother her resulting strike. Katie McCabe and Richardson were on target either side of McConnell’s third point, and an elongated Ballyboughal move ended in a fine score for Caroline Brennan. Erin Healy’s magnificent solo point reduced the gap to a minimum, before their opponents suffered a hammer blow in the form of an injury to O’Brien. Her absence was keenly-felt by Ballyboughal – whose defensive line was breached at the end of a subsequent attack. Gibbons continued to drive forward from wing-back and her latest foray into enemy territory led to an outstanding 24th-minute three-pointer. Eager to build on this confidence boost, O’Dwyers registered two points in the space of 60 seconds through Richardson (free) and Carla Munson. Brennan raced past a host of defenders to kick another score for Ballyboughal but, when the half-time whistle sounded, they were three points in arrears (0-8 to 1-8). Indeed, O’Dwyers moved further into the ascendancy on the restart – when a rampant Richardson bolstered her own personal haul with another fine point. A determined Ballyboughal replied through a McConnell free, though they had to wait another 21 minutes to add their next score of the night. During this barren spell for their counterparts, O’Dwyers sought to take advantage with some intricate attacking play. While they passed up some good opportunities, O’Hara and Richardson kept the scoreboard ticking over as the final-quarter approached. Richardson was proving to be a reliable source of scores from both play and placed-balls – and she added a fourth free on 47 minutes to stretch out the O’Dwyers lead. Ruth Weakliam was an assured presence in defence throughout, and she joined half-back partner Gibbons on the scoresheet with a superb single. With seven points now separating the teams (1-13 to 0-9), the odds were stacked against Ballyboughal. They continued to fight for their lives, though, and were eventually rewarded with a routine pointed free courtesy of McConnell. They breathed a sigh of relief when Richardson blasted a goal chance marginally past the right-hand upright, but a McCabe free soon restored order for O’Dwyers. Deep into second-half stoppage-time, Brennan kicked her third point for Ballyboughal at a tight right-hand angle. O’Dwyers were in control of their own destiny, though, and Richardson completed the scoring on 65 minutes to send the Balbriggan faithful into raptures. Scorers for O’Dwyers: Shannon Richardson 0-8 (5f), Amy Gibbons 1-0, Katie McCabe (2f), Shauna O’Hara (1f) 0-2 each, Ruth Weakliam, Erin Healy, Carla Munson 0-1 each. Scorers for Ballyboughal: Ciara McConnell 0-5 (3f), Caroline Brennan 0-3, Gioia Morgan Fox 0-2, Katelyn O’Brien 0-1. O’DWYERS: Niamh Kirby; Aoife Breathnach, Fiona Hogan, Saoirse Blount; Amy Gibbons, Ruth Weakliam, Alana Kelly; Erica Byrne, Erin Healy; Katie McCabe, Shannon Richardson, Lucy Kidd; Carla Munson, Shauna O’Hara, Alex Tyrell. Subs: Dominika Lewandowska for Kidd, Chloe Flynn for Blount (both 43). 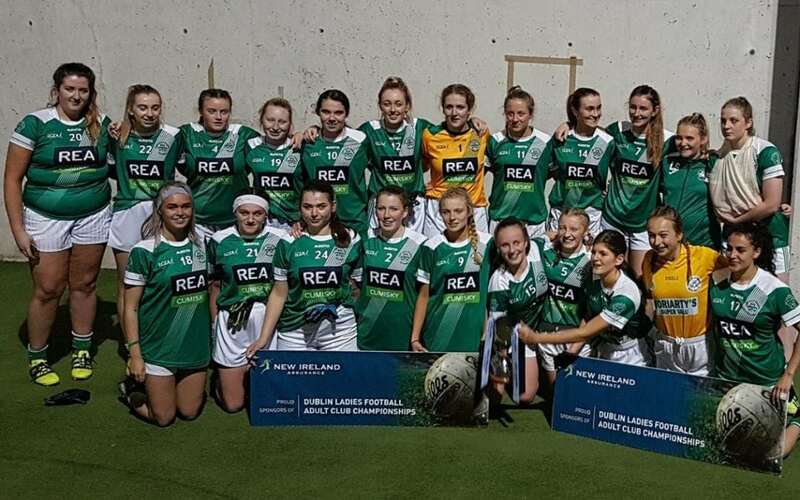 BALLYBOUGHAL: Sharon McGuirk; Sinead Arthurs, Kate Fagan, Niamh Counihan; Sarah Willis, Sinead O’Keefe, Louise Wogan; Aoife Hennessy, Aoibhne Counihan; Katelyn O’Brien, Louise Fagan, Caroline Brennan; Sally Farrell, Gioia Morgan Fox, Ciara McConnell. Subs: Sayra Lynch for O’Brien (23), Katie Flynn for A Counihan (half-time), Laura Kennedy for Fox (45), Aisling Rooney for Arthurs (60).